I think I've said it before, September is a huge transition month in the mountains. Unlike New Jersey where we had four seasons, all of roughly the same length and well defined by the weather trends and flora, here we have two seasons--winter and summer with a few weeks in between. September is our Fall season and we transition from Summer to Winter quickly. Fall color in the Laramie River Valley. Average daytime and nighttime temperatures are now 20 degrees cooler. We've had a number of frosty mornings and even a couple of snow showers. The leaves, mostly aspen but also some willows and cottonwoods, have turned to bright warm autumn colors, then fallen off. The wildlife we see has changed, with fewer moose and a lot fewer birds. 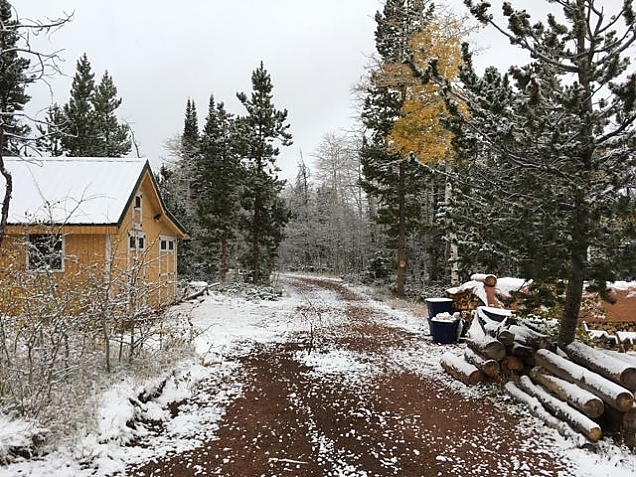 We had a couple of snow showers in September. It is pack rat season. September is when they start working on a nest for winter hibernation. And, they seem to like it under the hoods of the trucks, in the storage shed, or other cozy places. We caught one in a live trap and released it. Two more fell victim to regular rat traps. After those three were eliminated, it seems we don't have any more this year. Knock on wood. It has been a productive month for us. We got the propane generator installed and wired to provide backup power in case the PV system can't keep up over several stormy days. The same propane tank is now also hooked up to our (old) refrigerator in the storage shed. That shed is outfitted with shelves ready to hold winter food and other supplies. The shed is mostly insulated (with a bit more to do) and has a fresh coat of paint. It still needs a new roof. We built a wood shed. I am very proud of the result. We now have a place within steps of our "back" door where we can store several cords of wood and keep it dry. We might even sacrifice some wood storage to keep the snow blower in there. Not sure yet. The shed is done, nicely trimmed and painted, even beyond past photos documenting our progress. We don't like the paint color, so will still need to do a coat or two to change it. And, we've cut several more cords of wood, some now in the wood shed. There is more to go. Assuming we burn an average of 5 square feet of wood each day over a 200 day fall/winter/spring, we'll need about 1000 square feet of wood. A cord is 128 square feet, so that is about 8 cords. I think we have about 5 cut, split and stacked. My goal was to have 7-8 cords by the end of September, so we did not meet that goal. 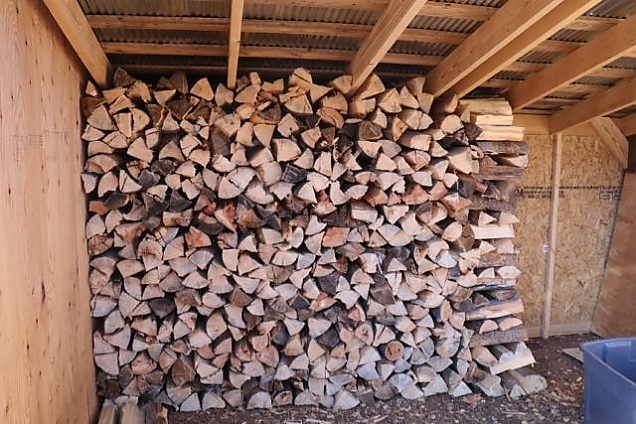 But, we are in very good shape and it is possible to continue to harvest and cut wood through much of the winter. Starting to fill the wood shed! I have learned a lot about my chain saws. John at the Hegge Lumber Saw Shop has showed me how to better sharpen the chains. And, I now have multiple chains for each saw and can change them quickly. It makes a huge difference cutting wood with a sharp saw! We've started using some of the wood with early morning fires to get rid of the overnight chill in the cabin. We keep the propane heater set to 65 degrees, and it has started running once or twice a night. I had some acrylic panels made to fit in the screened-in porch windows. We are hoping that by blocking off the porch to the outside air with these panels, we will be able to extend the time we can spend on the porch. In any case, these panels will keep the wind and snow off the porch. We have a portable propane heater, too, that might help keep it warm. It won't be completely closed off, but enough to be comfortable (we hope). I still need to cut trim to use to secure the panels in the window openings and get them installed. Maybe a good project for this weekend. We ordered a set of Camoplast tracks for the Ranger. I got word today that they are in, so we need to arrange to take the Ranger into town to have them installed. That will mean no more day trips in the Ranger, at least until we get snow. The tracks are four season tracks, so it is okay to use them on the dry roads, but the experience would not be as fun as with tires. So, we can still use the Ranger to gather wood, etc, but not recreationally. With the tracks installed, we can be highly confident in our ability to get out of here even if the roads are closed due to snow. We plan to leave one of our trucks at the state line, especially when there is a forecast of heavy snow. We still need to be introduced to the person who owns the property where we'd like to leave it. Destin continues to grow and bring us joy. He is now 75 pounds at just over 6 months of age. He thinks the whole mountain is his yard and will roam freely anywhere we've taken walks. Often, he'd rather roam that come to us when called, so we need to work on that. 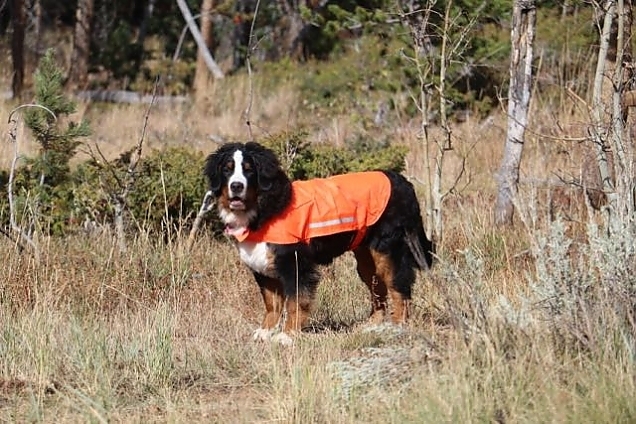 Meantime, with hunting season starting, he and the other dogs wear blaze orange scarves and coats when we go outside. Destin in his blaze orange vest, ready for hunting season. We took Destin to a dog show in Greeley, Colorado early in the month. He did not do well, but it was great to see a lot of our "dog show" friends that we had not seen in 10 years. 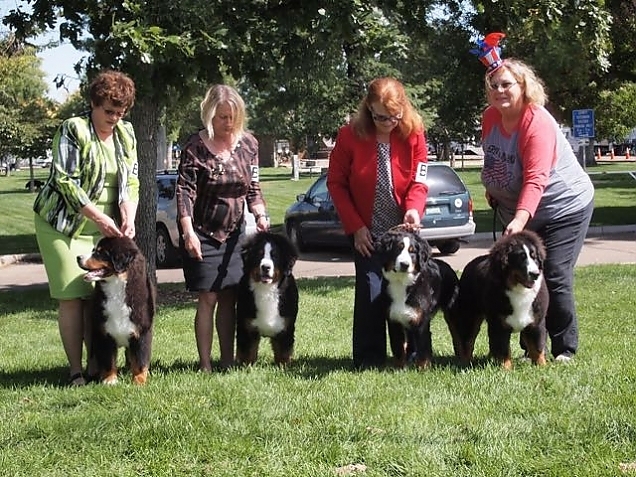 Destin, second from the left, with his brothers and sisters at the Greeley Dog Show. Last month we took delivery of and installed some new appliances. We now have a shiny new propane refrigerator and stove. We've had some trouble getting them working right. The refrigerator would not start and we finally got someone from town to come out and fix it. The manufacturer reimburse the cost of that. And, now the range is giving us problems. The stove and broiler just won't light. The manufacturer thinks it is a switch and they are sending me a replacement. Once we get everything working, I think they will be great appliances--far better than the 16 year old versions we had. Football season has started. I am enjoying taking Sunday afternoons off and just sitting in front of the TV and rooting for the Broncos. I did not watch football weekly for the past 10 years. It is not Lynne's favorite thing, but she stays occupied reading or knitting. We got a couple of day trips in last month. One day we packed up all the dogs and went in a big circle through Red Feather Lakes and home by Deadman Road. It was a multi-hour trip, all on dirt roads. It was very windy, so we did not really get out of the truck other than to grab some lunch in Red Feather Lakes. 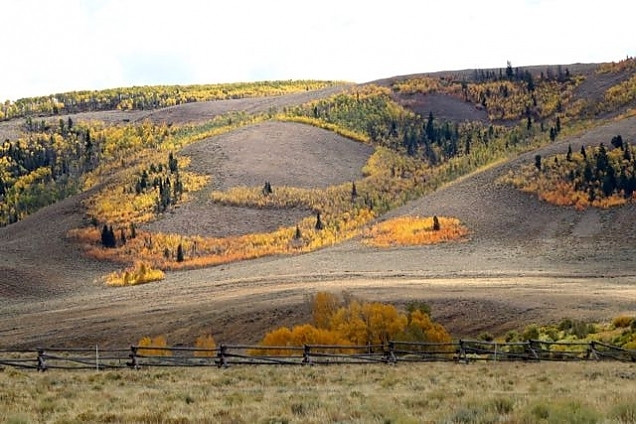 But, the aspen trees were in full color in many places and it was fun to make the circle. Bella does not like riding in the truck, but we made her go. Aspen trees just starting to change on Deadman Road. 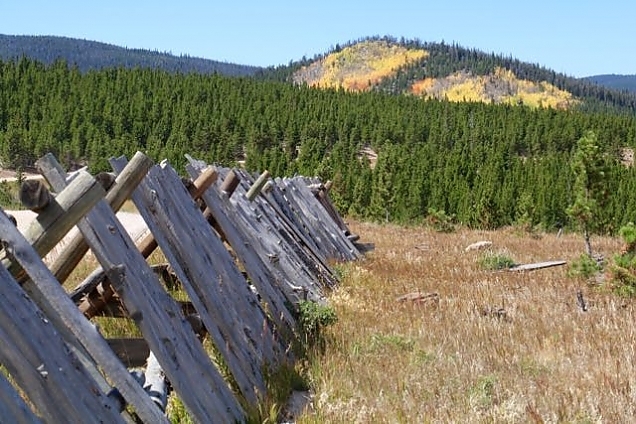 On another day trip, also leaf peeping, we went up the Laramie River to Chambers Lake on CO Hwy 14, then down to Walden, up to Woods Landing, the back up the Laramie River Valley to Sand Creek Pass and home. Destin and Hailey had a good time and even got to sit with us as we ate lunch at a cafe in Walden. Bella stayed home. We now have Colorado drivers' licenses. And, the trucks are registered. Ouch, it costs a lot to register a vehicle in Colorado. We also registered to vote.